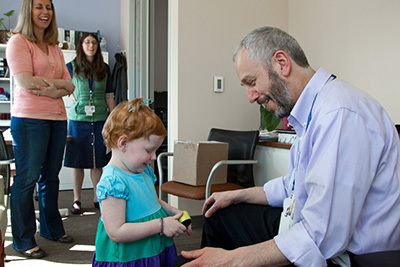 Kendall Layous meets with her doctor, Saleh Adi, MD, a pediatric endocrinologist, at the Madison Clinic while Kendall's mother, Shonda, far left, and nurse practitioner Nicole Rotter, PNP, CDE, look on in the background. In the two years since the Madison Clinic for Pediatric Diabetes was established through an anonymous, $10 million gift, it has evolved into a state-of-the-art facility with innovative programs and a new home on the Mission Bay campus. The Madison Clinic at Mission Bay, now located steps away from the future UCSF Benioff Children’s Hospital, offers comprehensive care for children and young adults with diabetes, with an emphasis on patient education, empowerment and the use of advanced technologies. It also has a commitment to advancing research in the management of diabetes in children. A multidisciplinary team - including endocrinologists, clinical psychologists, nurses, diabetes educators, social workers, dietitians, and administrative staff - ensures patients' varying needs are met. 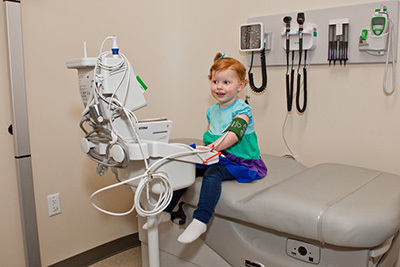 Two-and-a-half-year-old Kendall Layous, diagnosed with Type 1 diabetes, gets her blood pressure checked during a visit at the Madison Clinic for Pediatric Diabetes. Shonda and Brad Layous know firsthand how much is required of parents with diabetic children. Their daughter Kendall was diagnosed with type 1 diabetes in April 2012, two days after her second birthday. There currently are 25.8 million children and adults in the United States, or 8.3 percent of the population, living with diabetes, according to the American Diabetes Association. One in every 400 children and adolescents younger than age 20 has the chronic disease, which is characterized by the body’s inability to regulate blood glucose, or blood sugar, levels. The new Madison Clinic at Mission Bay was designed with the patient experience and clinician workflow in mind, according to Theresa Garnero, a nurse as well as the clinic’s practice manager. Upon entering, visitors are greeted with warm colors and an open, friendly environment. A Wii Fit video game station and therapeutic art room add to the relaxed ambience. “The space at Mission Bay is wonderful. There is plenty of space for doctor and specialist consultation, and the warm and kid-friendly environment provides for a peaceful experience during appointments that could otherwise be quite challenging,” Layous added. 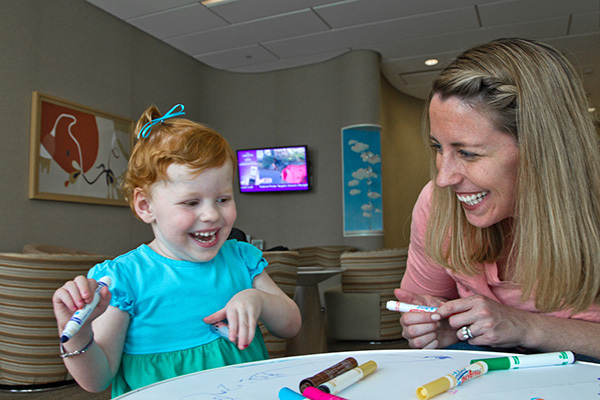 Kendall Layous, and her mother Shonda, make drawings that are used as table-top covers, part of an art therapy program at the Madison Clinic for Pediatric Diabetes. Staff benefit from a communal office space in the back of the clinic that promotes collaboration and a greater number of dedicated consultation rooms for patient meetings. The clinic also offers a classroom for patient-related educational activities, such as insulin pump classes. The Madison Clinic also offers several innovative new clinical programs, designed to improve the patient experience and outcomes. One such program is a revised model of case management, in which each child and his or her family is paired with a specific nurse and physician team for the duration of their care in order to optimize a patient’s health. The UCSF team also plans to set up satellite clinics in different parts of California to bring services closer to patient populations in the Monterey peninsula, Central Valley and elsewhere. Most recently, the Madison Clinic established a groundbreaking transition program designed to help teens and young adults manage their own diabetes care as they become adults. According to Diana Naranjo, PhD, one of the clinic’s two staff clinical psychologists, countless patients around the country are lost during the shift from pediatric to adult models of care, and this can have devastating consequences on their long-term health. To provide greater continuity of care, the clinic also recruited two endocrinologists who are dually trained in pediatric and adult medicine. They can care for patients from childhood through young adulthood with a seamless transition. Diabetes nurse practitioner Nicole Rotter, CPNP, CDE, examines Kendall Layous during a visit at the Madison Clinic for Pediatric Diabetes. A key component of the transition program is Marcela Arregui Reyes, who came on board at the beginning of the year as the clinic’s first full-time transition coordinator. The position – guaranteed for two years through a grant from the UCSF Diabetes Family Fund – involves advocating for patients and acting as a liaison between patients and providers throughout the transition process. Arregui Reyes will meet with patients and their families starting at the age of 14, and conduct annual assessments to better understand each individual’s needs. The transition program also will incorporate regular group meetings with staff psychologists, as well as evening seminars for patients and their families that address topics, such as how to manage diabetes after leaving for college. A newly created Youth Advisory Board will provide a unique outlet for patients to gather informally and share experiences and knowledge.